Norfolk's butterflies, bees, bugs, birds, trees and mammals are at major risk from climate change as temperatures rise — according to new research from the University of East Anglia. Researchers carried out the first in-depth audit of its kind for a region in the UK to see how biodiversity might be impacted in Norfolk as the world warms. The study finds that the region's Swallowtail Butterfly, which can't be found anywhere else in the UK, is at risk – along with three quarters of bumblebee, grasshopper and moth species. Dr Jeff Price analysed local populations of 834 species found throughout Norfolk to show how they might fare as climate change reaches 2oC — the upper end of the UN's Paris Climate Agreement goals. He also looked at what will happen at 3.2oC — the current global trajectory if countries meet their international pledges to reduce CO2. The results, published today in Transactions of the Norfolk and Norwich Naturalists' Society, are sobering. The project reveals that at just 2oC, 72 per cent of bumblebees in Norfolk could be lost, along with 75 per cent of grasshoppers and bush crickets, and 68 per cent of larger moths. The new climate potentially becomes unsuitable for 15 species of birds including Lapland Bunting and Pink-footed Goose. Meanwhile the Common Shrew, Roe Deer and European Badger are among seven mammal species which may be lost from Norfolk. The Swallowtail Butterfly, local only to the Norfolk Broads, and Red Admirals are among 11 types of butterfly which could be affected. The Common Frog, Great Crested Newt, Adders, and the Common Lizard could also be lost. As climate change reaches 3.2oC, temperatures would be largely or completely unsuitable for mammals including Grey Squirrels, Whiskered Bats and Reeves' Muntjac and trees including Silver Birch, Horse Chestnut, Scots Pine and Norway Spruce. Additionally, 83 per cent of shield bugs, 84 per cent of moths, 78 per cent of bumblebees, and 45 per cent of butterflies including the Small Tortoiseshell could also be affected. The findings come after UEA research revealed that up to half of all plant and animal species in the world's most naturally rich areas could face local extinction by the turn of the century due to climate change if carbon emissions continue to rise unchecked. Lead researcher Dr Jeff Price, from UEA's Tyndall Centre for Climate Change Research and School of Environmental Sciences, said: "This research shows that climate change really will pose increasing risks to biodiversity both globally and in Norfolk. "This is a comprehensive investigation of how climate change will impact Norfolk's biodiversity. I was able to carry out this research thanks to a long tradition of citizen science in the county. The Norfolk and Norwich Naturalist's Society was founded in 1869 and their members provided data used in the study. "Robert Marsham (1708-1797) of Stratton Strawless, Norfolk, is considered to be the founding father of the science of phenology through his painstaking studying over 60 years published as Indications of Spring. The effect of changing seasons on plants and animals is now one of the well-documented consequences of climate change. "The important thing to remember here is that global warming has already reached 1oC above pre-industrial levels. We're currently on a trajectory for 3.2oC if international pledges to reduce CO2 are genuine. If so, major changes need to be made to how we use and produce our energy. "Norfolk's offshore wind turbines are an excellent example of the beginning of the transition that is needed worldwide to protect biodiversity here in Norfolk and everywhere else. "The Paris Climate Agreement aims to put the world on track to avoid dangerous climate change by limiting global warming to 1.5oC. If this is achieved, the climate would still be suitable for the majority of wildlife in Norfolk. "But 2oC is a tipping point at which climate conditions will become largely or completely unsuitable for many species. "Insects are essential food to many other species. Their decline will have a knock-on effect for the food webs of Norfolk's ecosystems of the Broads and the Coast. "The loss of bumblebees potentially has a major impact on pollination of crops and other plants," he added. David North, head of People and Wildlife at Norfolk Wildlife Trust, said: "'The likely impacts of climate change on our wildlife, shown by this detailed research, are hugely worrying. 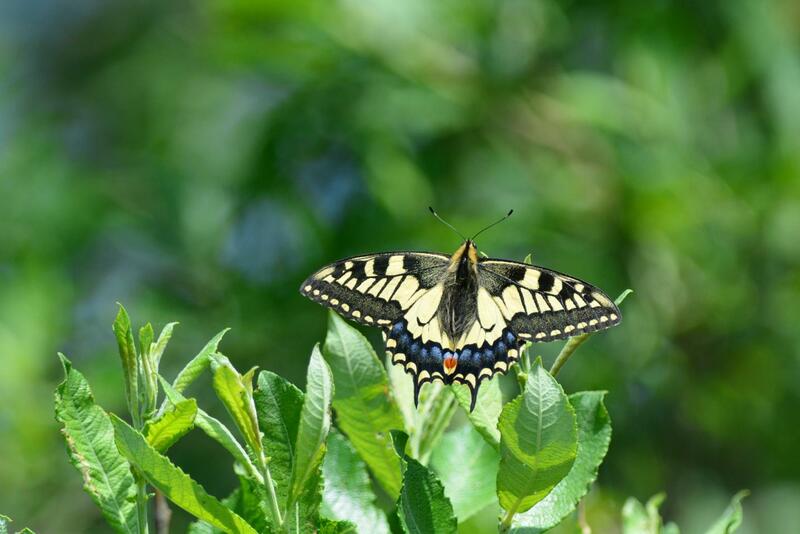 "It is unthinkable that, with a warming of 2oC, swallowtails would very likely vanish from the Norfolk Broads — and being totally dependent on their food plant, milk parsley, it won't be possible for them to adapt by moving elsewhere. "Unless we take bold action to limit warming to below this level there will be huge changes to our wildlife — both common and rare." Not all taxa were examined as part of this study, but future work will look in detail at hoverflies, spiders and flowering plants. 'The potential impacts of climate change on the biodiversity of Norfolk Species' is published in Transactions of the Norfolk and Norwich Naturalists' Society.